Nice, light quilt. Perfect for spring and to lighten up a room. The chevron design and cotton weave of this quilt set will infuse your room with a sense of placid, rustic calm that you'll love when you lay down for a good night's sleep. Includes a quilt and two pillow shams (1 sham in twin set) that are made of 100-percent cotton that is fully machine washable. Photo makes it look good ! I was not pleasantly surprised when I received my quilted bedspread. The quality is quite good, nice weight, The binding is well done, but that is where the good stops. This bedspread is undersized and the shams are too small for a standard size pillow. I chose to keep mine because it is the first one I have found that is of good quality I am going to add a band around the edges to extend the size and make it so that it goes up and over the pillows so there will be no need for shams. So if you have the ability to sew and quilt you can make it work. I would add, the king-size would be perfect for a queen size bed. Quilt is of good material. Seams and edges appear to be sturdy (only washed once before this review). I don't like that the King size came with standard sized shams...What's the sense in that? Not upsetting enough to return. Seems to fit my regular king; however doesn't skim the top of the bed railing or even cover the box spring. Me personally I don't mind this since my bed is custom fabricated and I want the railings to be seen. 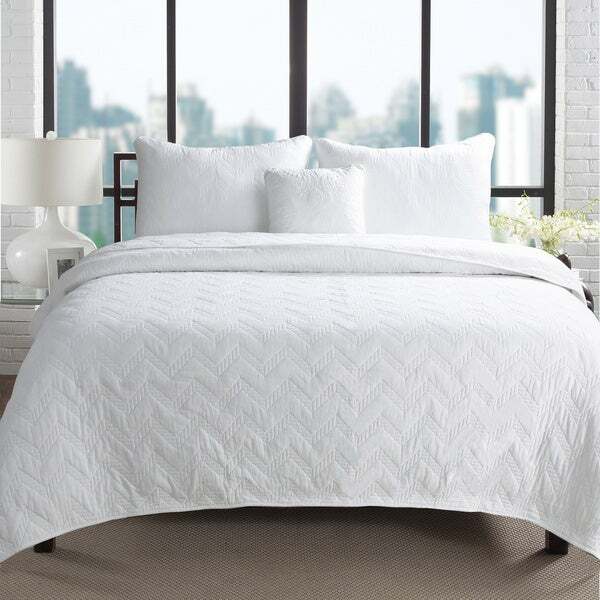 If you are looking for a soft cotton quilt that has a cute chevron pattern, but is timeless because of its white color, this is it! I am so happy with my purchase! Even considering ordering another one for our bed. This quilt is worth its prime, however I wasn't too happy with the tone of the white, it's a little 'off' and not quite bright. Also, not crazy about the design. But it is indeed 100% cotton and it comes with 2 pillow shams. The size is also good for a full or queen bed. It's really a matter of personal taste. This is a basic cotton quilt. I bought it in Cal King and it is sized correctly--reaches nearly to the ground on both sides when the bed is made up. The stitching is solid, no loose threads, no breaks after washing and drying. Very good value for the money. This is exactly what I was looking for. I wanted a white, contemporary, light weight coverlet for my bed and this is perfect. The price was excellent and it also came with two pillow shams. I would recommend it to everyone! I love it so much that I even took a picture of the pattern to show it to my Mom and my BFF. I use this in my rental beach house. I love it because it washes great. no one wants to use a coverlet used by the last guest and not be clean. Looks great with any color of nautical or beach theme. I actually have this on two queens and 3 twins. Can't beat the price. Love the contemporary chevron design and the clean look of white. It has snagged here and there but I've found that to be the case with quilted covers. I ordered one size larger than my bed so I don't need a bed skirt. AMAZING! Will be getting another one! This quilt is thick and such a pretty design. We will be getting another one! Ordered two years ago and am ordering another for second home. Soft and comfortable. Cool crisp white cotton very modern and cool...I love it! really well made! will last a long time! Really nice quality and looks great...like what you find in a luxurious moderrn resort hotel!!! Just OK. Could be better. The white is a super bleached white color. Beautiful design and perfect weight. Great overstock price. Go for it! I love that this is 100% cotton. It has also held up well to weekly washings and occasional bleachings. It's the perfect weight for year-round use in the South . The only negative I've noticed is that the batting tends to shift a little. First thing I ever had to return to overstock. "How much does the comforter weigh?" It varies on the size- from 6 to 9 lbs. "can you please explain the difference between using a coverlet in the summer or going with a duvet cover. I would assume the coverlet lighter, but was wondering if a coverlet would actually be warm enough up in the mountains in the summer. any thoughts great." "What is the weight of the queen size comforter?" It's a perfect weight for the summer. It's exactly what I had wanted weight wise. "Does the king set come with king size shams??? Review above mentioned otherwise." Hello SassyTX720, the King features standard size shams. Please feel free to contact us again with any further questions. Thank you for shopping with us! I have queen size pillows which fit fine. I don't think king size pillows would fit. 100% cotton solid white--just what I was looking for!